"Ponte Vecchio 18K Rose Gold & 0.22ct. Diamonds Ring Size 6.75"
"Ponte Vecchio 18K Rose Gold & 0.22ct. Diamonds Ring Size 6.75 Features: Brand: Ponte Vecchio Gender: Womens Condition: Excellent Material: 18K Rose Gold Stone: 0.22ct. 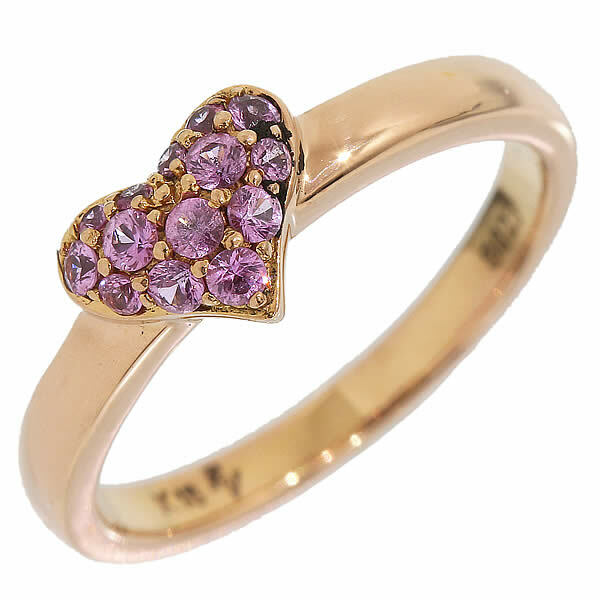 Diamond Weight: 5.2g --- 0.183oz Note: Includes Box"
"Ponte Vecchio 18K Rose Gold 0.23 Ct Pink Sapphire Heart Ring Size 4.75"
"Ponte Vecchio 18K Rose Gold 0.23 Ct Pink Sapphire Heart Ring Size 4.75 Features: Brand: Ponte Vecchio Gender: Womens Condition: Good Metal: 18K Rose Gold Stone: 0.23 Ct Pink Sapphire Weight: 3.1 grams Sku: 3-Ij1Nn587 Comes With TrueFacet Valuation Report"
"Ponte Vecchio 18k Rose Gold Ruby Diamond Ribbon Motif Necklace"
"Ponte Vecchio 18k Rose Gold Ruby Diamond Ribbon Motif Necklace Features: Brand: Ponte Vecchio Gender: Womens Condition: Very Good Material: 18K Rose Gold Stone: 0.27ct Ruby & 0.03ct Diamond Weight: Approx. 3 g"
"Ponte Vecchio 18K Rose Gold with 0.60ct Amethyst & 0.02ct Diamonds"
"Ponte Vecchio 18K Rose Gold with 0.60ct Amethyst & 0.02ct Diamonds Heart Necklace Features: Brand: Ponte Vecchio Gender: Womens Condition: Excellent Material: 18K Rose Gold Stone: 0.60ct Amethyst & 0.02ct Diamonds Weight: 2.5g --- 0.08oz"
"Ponte Vecchio 18K White Gold & 0.10ct. Diamonds Heart Pendant Necklace"
"Ponte Vecchio 18K White Gold & 0.10ct. Diamonds Heart Pendant Necklace Features: Brand: Ponte Vecchio Gender: Womens Condition: Excellent Material: 18K White Gold Stone: 0.10ct. Diamond Weight: 4.6g --- 0.16oz"
"Ponte Vecchio 18k White Gold 0.13ct. Diamond Heart Ring Size 4.5"
"Ponte Vecchio 18k White Gold 0.13ct. Diamond Heart Ring Size 4.5 Features: Brand: Ponte Vecchio Gender: Womens Condition: Very Good (Minor Scratches) Material: 18K White Gold Stone: 0.13ct Diamond Weight: Approx. 8.8 g"
"Ponte Vecchio 18K White Gold & 0.13ct Diamond Rose Pendant Necklace"
"Ponte Vecchio 18K White Gold & 0.13ct Diamond Rose Pendant Necklace Features: Brand: Ponte Vecchio Gender: Womens Condition: Excellent Material: 18K White Gold Stone: 0.13ct. Diamond Weight: 5.9g --- 0.20oz"
"Ponte Vecchio 18k White Gold 0.20ct. Diamond Flower Motif Bracelet"
"Ponte Vecchio 18k White Gold 0.20ct. Diamond Flower Motif Bracelet Features: Brand: Ponte Vecchio Gender: Womens Condition: Very Good (Bit Signs of Wear with Few Scratches and Dirt) Material: 18K White Gold Stone: 0.20ct Diamond Weight: Approx. 5 g"
"Ponte Vecchio 18k White Gold 0.28ct. Diamond Cross Pendant Necklace"
"Ponte Vecchio 18k White Gold 0.28ct. Diamond Cross Pendant Necklace Features: Brand: Ponte Vecchio Gender: Womens Condition: Very Good (Some Signs of Wear) Metal: 18k White Gold Stone: 0.28ct Diamond Weight: 3.8 grams"
"Ponte Vecchio 18K White Gold & 0.38ct White & 0.40ct Black Diamond"
"Ponte Vecchio 18K White Gold & 0.38ct White & 0.40ct Black Diamond Starfish Necklace Features: Brand: Ponte Vecchio Gender: Womens Condition: Excellent Material: 18K White Gold Stone: 0.38ct White & 0.40ct Black Diamond Weight: 6.9g --- 0.24oz"